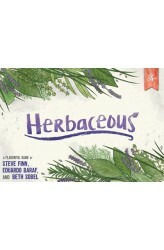 In Herbaceous, herb collectors compete to grow and store the most valuable medley of herbs. Everyone starts with four containers, each of which allows a different grouping action: Group herbs of same type Group different types Group pairs Group any three types (same or different) On your turn, you draw an herb, then decide to either keep it in your personal collection or put in into the communal pile. If kept, the next card goes to the communal pile; if placed in the communal pile, the next card goes in your personal collection. At the start of your turn, you can decide to use a container. If so, you assemble cards from personal and communal spaces, group them, then turn them all over. 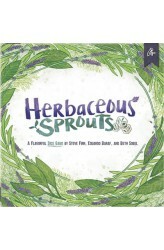 You have then "collected" those and can't use the container a..
A FLAVORFUL DICE GAME Everyone has a green thumb when playing Herbaceous Sprouts. Unwind while enjoying this beautiful and thoughtful game of collecting seeds, using tools, and growing sprouts in the community garden. Gather your seeds and tools from the shed, but don’t take too long or your friend might become the Head Gardner first. OBJECTIVE Become the Head Gardener by collecting herb and flower seeds and using your garden tools to plant in the community garden and scoring the most points. Each round, gardeners take turns collecting herb and flower seeds (represented by dice) which they place and save in their wheelbarrow, as well as tools (represented by cards) which they use to plant sprouts. Players can plant quickly for low point spots, or push their luck s..